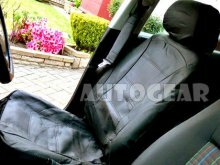 Lo-Back Taxi Leather look range style black seat covers set. Quick & easy to fit most cars. This seat cover set is available with velcro style seams to accommodate car seats with integrated side airbags. This special set includes front/rear seat covers, 5 headrest covers, 2 harness pads & 1 steering wheel cover.